Also known as oral corticosteroids or oral steroids, glucocorticoids, along with injected steroids, are known as systemic steroids. They are a second line eczema treatment. 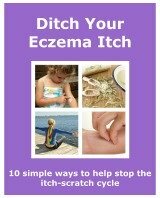 They are used when your eczema is severe and widespread. If eczema covers a large area, using topical corticosteroids is impractical. The amount needed and the time it would take to apply it would be huge. Glucocorticoids can be taken either in tablet or liquid form. The most common ones used are prednisolone and prednisone. They work by numbing down the immune system. An overactive immune system can cause the symptoms of eczema. They help to reduce inflammation, so helping to break the itch-scratch cycle. They can be used by adults and children. But must not be used if you are pregnant or breastfeeding. Glucocorticoids are normally prescribed as a short course, and the lowest dose is used. This dosage will help to clear the worst of it. After that, your regular eczema treatment should be used to keep the eczema under control. Use emollients and topical corticosteroids. A short course usually lasts between 1-4 weeks. There are not normally any side effects when using them for a short time. A long course can be prescribed. This usually lasts over 3 months. When glucocorticoids are used long term, a steroid use card needs to be carried at all times. The longer the course the more likely there are of potential side effects. It may seem that there are more negatives than positives to taking glucocorticoids. It has to be remembered that it is only taken if your eczema is very severe. In most cases it is not needed for long periods of time. It tends to clear a flare up quickly, and then other treatments can be used to maintain the condition of the skin. When coming off the treatment, it must not be stopped suddenly. It has to be gradually reduced. Sometimes over days, and sometimes over weeks. It depends how long the treatment has been taken for. One of the reasons it is done slowly is because of the body's own natural production of steroid. When a course of glucocorticoids are started the body stops producing it's own. If the treatment is stopped in one go the body has had no time to make any of it's own. So there is none in the system. This can be dangerous. When the treatment is gradually stopped, the body has an opportunity to start making it's own again. Never come off the treatment yourself. Only do it on the advice of your doctor. They will monitor your progress. When looking at using glucocorticoids, it is definitely worth looking into the benefits of the treatment. These could outweigh the potential side effects. When you are use a stronger dosage and with a higher risk of side effects, it wil be more beneficial for your eczema. Your doctor or dermatologist is always the best person to talk to. It can be very helpful to get some personal experiences of people who have used them.